Christian Folin during action last season for the Kings. The Flyers signed free-agent defenseman Christian Folin on Thursday, giving them depth and some physicality on the back end. A native of Sweden, Folin received a one-year deal that carries an $800,000 cap hit, according to capfriendly.com. By comparison, Brandon Manning, who played for the Flyers last season and was also an unrestricted free agent, recently signed a two-year contract with Chicago that carries an annual cap hit of $2.25 million. 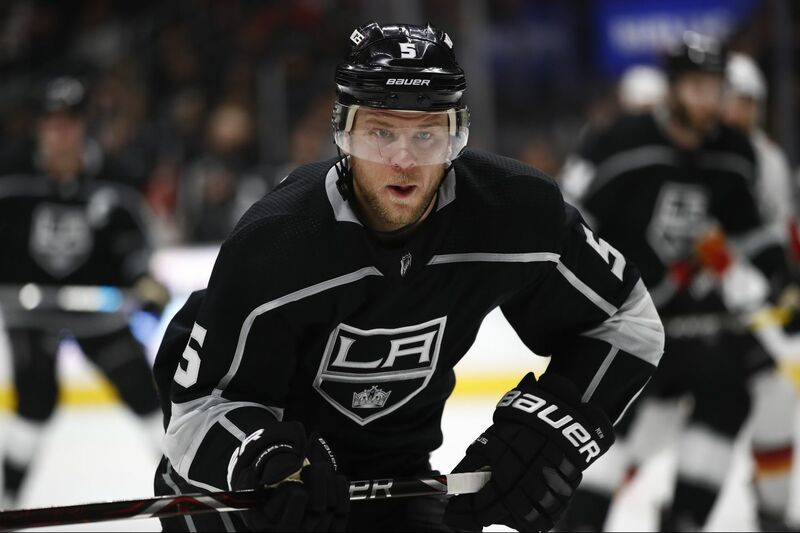 Folin, 27, a righthanded shooter who has spent four seasons in the NHL, will battle for a regular spot in training camp but will likely be the team's seventh defenseman. The top six is expected to include the following duos: Ivan Provorov and Shayne Gostisbehere, Radko Gudas and Travis Sanheim, and Andrew MacDonald and Robert Hagg. Hagg is a restricted free agent and still needs to come to terms with the Flyers, who gave him an $874,125 qualifying offer. He had a solid rookie season. Folin could be a stop-gap until Phil Myers is deemed NHL-ready. Myers, also a righthanded defenseman, will probably start the season with the AHL's Phantoms. In 65 games with Los Angeles last season, the 6-foot-3, 205-pound Folin had three goals, 10 assists, and a plus-3 rating. He led the team with an average of 2.6 hits and averaged 15 minutes, 35 seconds of ice time per game. Before last season, Folin appeared in 118 games with Minnesota, posting four goals, 19 assists, and a plus-15 rating. Folin came to North America to play junior hockey in 2010. He later played for two years at UMass-Lowell and helped the team win the Hockey East title in 2013 before signing with the Wild as a free agent. The Flyers were supposedly interested in signing Folin at the time, but he opted for Minnesota. The Flyers have $65.6 million in salary cap committed to 19 players for 2018-19; the salary-cap maximum is $79.5 million…..Restricted free agents Alex Lyon (2.75 GAA in 11 games last season) and Taylor Leier (one goal in 39 games) filed for salary arbitration. Both had received qualifying offers — Lyon's was $918,831, Leier's was $846,886 — and are still negotiating with the Flyers. If they don't reach a deal, a third party will decide their salary. Hearings will be held July 20 to Aug. 4.